Fans of the oldest Braxton sister already know her story as it has played out in the tabloids and in the reality show with her sisters, Braxton Family Values. There's not a whole lot to be learned in her new memoir, Unbreak My Heart, that we don't already know, but she does provide some insight into why she's made some of the decisions she's made. She's open and honest about her relationships with her parents, her sisters and even her ex-husband. To watch her on the family reality TV show, one might think that Toni's mother, Evelyn, has always been supportive of her career. It came as a shock to me that this was not the case and that Evelyn, at one point, tried to turn the other sisters against Toni for getting signed to a label when the sisters did not. Keeping this in mind, Toni has always reached back for her sisters, even when it wasn't necessarily in her best interest to do so. In the African-American community, a certain idea has persisted for generations: If one gets, we all get. We're all in the boat together, so we must all get out together. In my family, it was taboo to separate from the group. But secretly, that's exactly what I wanted to do. I didn't simply want to be an extension of my parents and siblings. I wanted to be an individual. Toni also speaks of how the family idea that you needed to suppress your feelings and push through prepared her for life in show business. It might seem that this lesson was lost on her sisters as they seem all too happy to put their lives on display. It's noticeable that of the five, she is the sister that appears on TV the least and seems to be the least willing to share details of her life with the viewing audience. Indeed, Braxton Family Values is a project she did to pay back the debt her mother imposed on her for making it so many years ago when her sisters didn't. She speaks of how painful bankruptcy was, not once, but twice, along with the chatter about how she found herself in that situation. She talks of the embarrassment she felt after appearing on the Oprah show, where Oprah seemed to take pleasure in berating her about how she'd spent her money. Toni has stated a number of times that tour costs and not an extravagant lifestyle were to blame for her first bankruptcy. Her second was the result of failure to perform in Las Vegas after health problems forced her to cancel her contractual obligations. 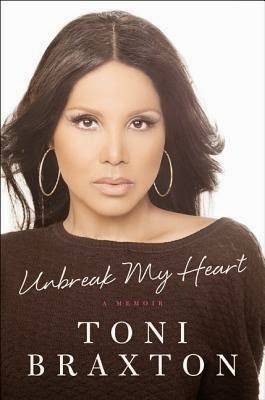 In reading Unbreak My Heart and even watching her on TV, you get the feeling that though Toni may have some divaish ways about her, she is ultimately a humble person. She is grateful for the opportunities she's been given and exhibits a quiet grace as she speaks about raising an autistic child, separating from her husband and quitting (and returning) to an industry that eats its own. Fans of her work, and even those unfamiliar with her prior to reading her memoir, will definitely come away with an appreciation of what she has endured. Disclaimer: Copy of book received from the publisher, opinions are my own.